The blue lake is a bit of a hidden gem and it's located not far from the main town of Dolgellau. Les and I have lived in North Wales for almost 3 years and before visiting at the weekend, we had no idea there even was a blue lake. Reaching the area isn't too difficult, although it is a fair walk and there's a bit of steep climbing involved. Walking from the village of Arthog (where you can park your car) shouldn't take more than 15-20 minutes. As the lake used to be a slate quarry, the terrain can be quite rough. Wearing sturdy, flat shoes is advisable. In other words, don't do what I did and wear flip flops. I had no idea what I was doing before I got there and really knew nothing about the site at all. If your husband tells you 'it's just a little walk along a wee path...', do NOT listen. It's not. The next time we go, I vow to be properly kitted out. Although the blue lake attracts a fair number of visitors throughout the season, if you visit early enough in the day, it's a hugely peaceful spot. It's popular for wild swimming, although obviously the water can be pretty chilly, depending on the time of year. It can also be a bit difficult to negotiate getting in and out, so take a bit of navigating. 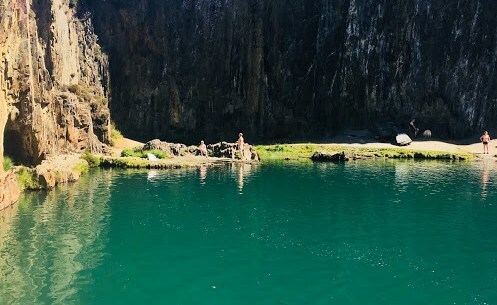 There have been several deaths through misadventure at Blue Lake, but stick to the lake itself and keep away from the crags above and this is unlikely be a problem. Getting the perfect selfie from the top really isn't worth the risk to your life, let's face it. The lake itself is full of beautiful clear, albeit very cold, water. It's safe to swim in and can get quite busy in the summer. Even if you're not going in for a bracing dip, the area is stunning and well worth the steep climb to get there. This was our first visit to the Blue Lake, but I think I can safely say it won't be the last. I had no idea that such a hidden gem has been under my nose this entire time. I posted a photo of the lake on my facebook page and it generated many comments about just how beautiful it was. I can't wait to go back.